UPDATED: Tue., Sept. 4, 2018, 9:42 p.m.
ATLANTA – Elena Delle Donne had a rather quiet night by her high standards. 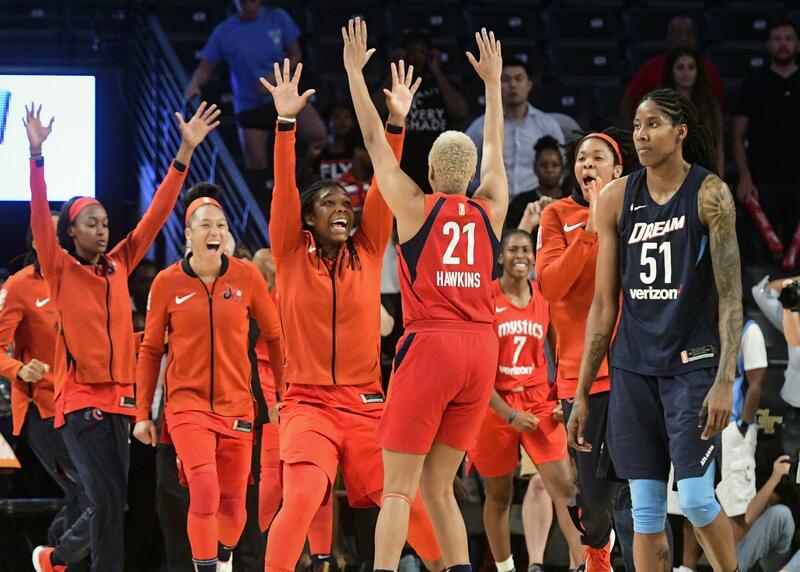 The Washington Mystics are headed to the WNBA Finals for the first time in franchise history. The Dream led 71-69 with just under 7 minutes remaining, but suddenly went cold at the worst time of a turnaround season. Washington seized the lead with a 9-0 run and survived a desperation 3-pointer by Tiffany Hayes, earning a spot in the Finals against Seattle. Yet this was really about Atkins, playing with the poise of a veteran while scoring 20 points. And Toliver, who came up huge in the first half and finished with 19. And don’t forget Hawkins, who chipped in with 17. Alex Bentley scored 16 points to lead five Atlanta players in double figures. But the Dream couldn’t overcome the loss of star Angel McCoughtry late in the regular season to a knee injury. “I just got done bawling in the locker room,” said red-eyed Nicki Collen, who earned coach of the year honors in her debut season for leading the Dream to a 23-11 record – an 11-win improvement over 2017. “I’m incredibly proud of this team. We’re further ahead than I thought we would be when I took this job. Toliver carried the load with 17 points – much of it from long range. She knocked down a 3-pointer from almost 30 feet and even tried one from just inside the midcourt stripe. In the end, Washington got the stops that mattered. After Bentley hit a 3 and Washington failed to get the ball inbounds, Atlanta had a chance to tie. But Bentley couldn’t get open, forcing Hayes to thrown up a wild shot that didn’t hit anything. Published: Sept. 4, 2018, 9:15 p.m. Updated: Sept. 4, 2018, 9:42 p.m.